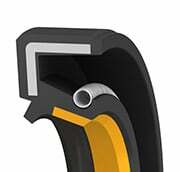 A proprietary PTFE element is bonded to the spring-loaded elastomer rubber seal lip and combines the low friction and wear properties of PTFE with the flexibility of the rubber to adapt quickly to ever-changing operating conditions. Combining these characteristics makes for a more durable seal with a longer operational life and better performance under arduous operating conditions compared to conventional rubber elastomer lip seals. 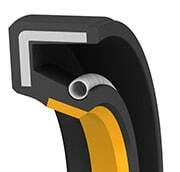 Rubber–covered steel-reinforced construction provides improved static sealing between the housing bore and the seal OD. Pressure: up to 60psi (4.1bar)* continuous, up to 100psi (6.9bar)* max. pressure spikes. For pressures exceeding 30psi (2bar), please contact engineering. Seals can not be operated at their upper pressure and speed rating at the same time! Premium spring-loaded double lip rotary shaft seal with proprietary blends of PTFE bonded to the sealing lip. Application-specific and proprietary seal designs are available. Please contact engineering to get the best seal for your rotary sealing applications. *Maximum values depend on seal material, seal configuration, media, temperatures, pressures, surface speed and working environment. Data provided are guidelines for ideal operating conditions. Seals cannot be operated at their upper pressure and speed ratings at the same time. For maximum seal life expectancy, do not operate your seal beyond 75% of any of its operating limits. Please consult engineering or call 1-800-283-7140 for advice. The PV-Rating of an AHPSeal rotary seal gives an indication of the seal’s ability to withstand the stress applied to a seal due to sealing pressure as the shaft rotates with velocity. The higher the PV-Rating is, the higher the seal’s ability is to handle a higher combination of pressure and rotational velocity, with 10 being the highest. 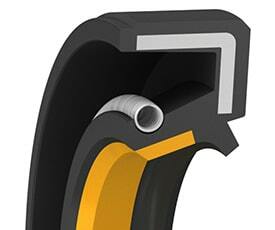 This is to only be used as a guide for lubricated operating conditions to narrow down possible sealing products. Please contact one of our experienced seal engineers to select the best seal for your application.